Simple to look at, this pair of pants from Global Desi will be a great choice for you. The use of a fine quality fabric into its tailoring ensures that you stay comfortable all day long. Besides, it flaunts a slub pattern, which renders it fashionable. 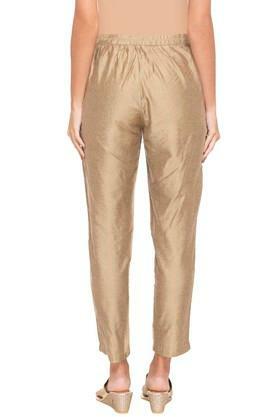 Get this trendy pair of pants and upgrade your clothing collection. You can match it with a kurta of your choice and look smart for any casual occasion. Doesn't look like the pic at all!! But I still retained it as the colour was still acceptable. A slightly different shade of golden. U have to decide whether you want it or give it back!!! But cloth wise, not bad...just ok.